Crocodile pictures showing the reptile actually catching something are rare but this one looks like it might tackle the Egyptian goose that is walking past it. Actually, after I snapped this crocodile picture the goose waded around happily in that area for awhile, ignoring the set of sharp teeth only a few feet away. 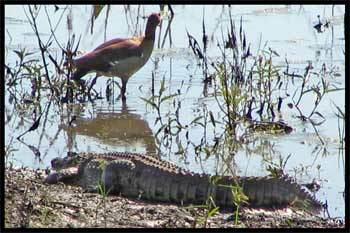 But the goose instinctively knows that a crocodile which you can see and that is out of the water is not much of a threat. It's the one you can't see because it is just below the surface of the water waiting for its chance to strike that you need to really worry about. Ok, I'm the first to admit it. Getting good pictures of crocodile where they don't look like the stump of a tree lying around or floating in the water can be tricky. And because waterholes and rivers in African National Parks tend to be reasonably far from the road you miss what otherwise would have made great crocodile photos. 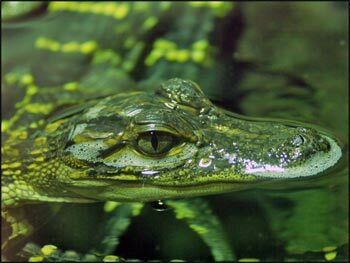 I have seen an elephant chase a croc into the water and another time the reptiles were catching catfish in plain view because the waterhole was drying out due to a drought. Would've loved to get pics of that but in both cases it was too far even for the 400mm zoom lens that I have on my camera. So the best way to get decent photos on your safari is to find a waterhole that is close to the road where crocodiles have been spotted before and then visit it regularly on the chance that one of the reptiles will be lying in the sun at a distance that will make for good photography.